Mission accomplished! Bags full of vital supplies are going to TASK this holiday season. Pictured with the students are advisors Jennifer Cook, far left, and Nichole Pollard, far right. 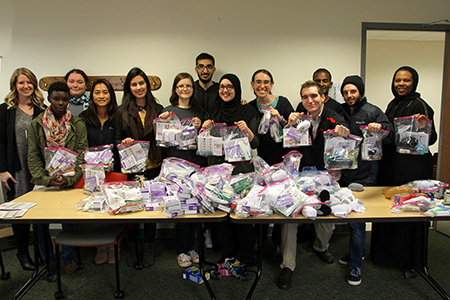 By combining efforts, compiling the bags was a smooth and rewarding assignment for PTK and MSA students. West Windsor, N.J. – When Mercer County Community College’s (MCCC's) Phi Theta Kappa (PTK) chapter began planning its community service activities for this semester, they decided to focus on clients at the Trenton Area Soup Kitchen (TASK). 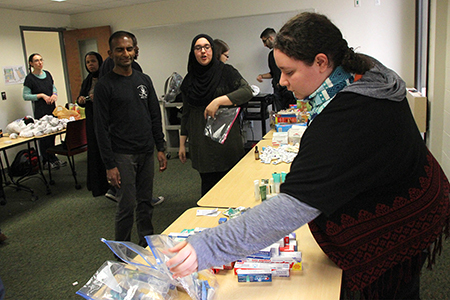 When they discovered that the Muslim Student Association (MSA) had carried out a project last fall that also focused on TASK, the two groups decided to combine their efforts this year. After a two-month drive to collect hygiene and other items, the groups got together this week to compile more than 100 bags of vital supplies – everything from snacks and socks, to toothbrushes, toothpaste, shampoo, lotions and soap. According to advisors Nichole Pollard (MSA) and Jennifer Cook (PTK), the bags that are being delivered to TASK during the holiday season represent a true gift of caring from MCCC students. Also leading the effort were MSA Vice President Rayana Dawarzai, PTK President Cody Willever, PTK Vice President of Leadership Christina Duncan and PTK Vice President of Fundraising/Service Liz Ovsyannikova. Cook added, "The students are especially grateful to everyone who contributed to help make the drive a success -- including many of their fellow students, as well as members of the MCCC staff."